World Track And Field Body Maintains Russian Suspension From Competition : The Two-Way The International Association of Athletics Federations found Russia had not reformed its state-sponsored track and field programs sufficiently to warrant reinstatement into international competition. Anastasiya Grigoryeva (center) during a 60-meter heat at the Russian Winter national athletics meet in Moscow on Sunday. Track and field's world governing body decided Monday to maintain Russia's suspension from international competition. 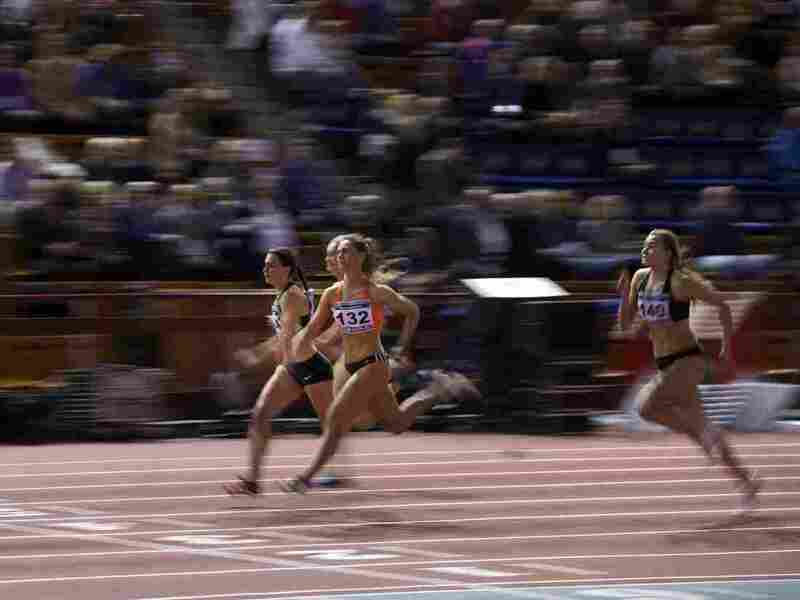 During a meeting of the International Association of Athletics Federations, or IAAF, the governing body's president, Sebastian Coe, told the AFP that Russia "could not be reintegrated into the sport before November." That means Russia's national track and field team will not be able to compete in the August IAAF World Championships in London, although wiggle room in the ban could allow Russian athletes who are approved individually by the IAAF and submit to drug testing to compete without a country affiliation. "Our priority is to return clean athletes to competition but we must all have confidence in the process," Coe said, according to a press release. "Clean Russian athletes have been badly let down by their national system." A task force report released Monday cited Russia's continued lack of sufficient testing for performance-enhancing drugs in its athletes as one of the reasons for its recommendation against reinstatement. In the report, the head of the task force, Rune Andersen, noted that Russia had made some progress by establishing a committee to investigate state collusion to cover up doping by Russian track and field athletes. "There continues to be very limited testing of Russian track & field athletes at the national level. Furthermore, there continue to be troubling incidents in respect of the testing that is taking place. For example, (i) on 25 January 2017 it was reported that five athletes had withdrawn from a national competition when they heard that DCOs had turned up to do drug testing; (ii) in at least one case, boxes of samples being shipped to foreign labs for testing were opened and inspected, and (it appears) attempts were made to open a sample bottle." The report also noted that a Russian TV broadcast in January "showed Vladimir Kazarin, who has been provisionally suspended since August, continuing to coach at least two top Russian athletes," as USA Today reported. As we have reported, the IAAF banned Russian athletes from competing in the 2016 Summer Olympics in Rio de Janeiro, "Because the system in Russia has been tainted by doping from top level and down, we cannot trust that what we call and what people might call clean athletes really are clean," Andersen said in a June 2016 announcement of the ban.
" 'The task force does consider, however, that if there are individual athletes can clearly and convincingly show that they are not tainted by the Russian system because they have been outside the country or subject to other strong anti-doping systems, including effective drug testing, then there should be a process through which they can apply for permission to compete in international competition — not for Russia, but as a neutral athlete,' [Andersen said]. "Additionally, athletes who have made an 'extraordinary contribution to the fight against doping in sport' should be able to apply for this permission, Andersen said [in June 2016]." Those exceptions eventually allowed one track and field athlete, Russian long jumper Darya Klishina, to compete in the Olympics, as The New York Times reported. On Monday, the IAAF approved a pair of recommended loopholes included in the task force report. The first allows athletes under age 15 to compete in international competitions as "neutral athletes," meaning they would not represent the Russian state. The second allows athletes between 15 and 18 and Masters-level athletes who want to compete neutrally be allowed to apply to the organization's doping review board for individual consideration. The Russian government has not commented on the governing body's decision.